Peter taught that “it is time for judgment to begin with the household of God; and if it begins with us first, what will be the outcome for those who do not obey the gospel of God?” (1 Pet. 4:17). When the great persecution at the hands of Antichrist is cut short by the appearance of Christ in the heavenlies, indeed “those who do not obey the gospel of God” are soon to find out! Like the natural line of Abraham, the seraphim of God began the process of purifying the professing church (as well as the unsaved line of the obedient woman of Israel), by overseeing the events associated with the first four seals, separating the wheat from the tares so to speak. Peter refers to this process of purification when he states “that the proof of your faith, being more precious than gold which is perishable, even though tested by fire, may be found to result in praise and glory and honor at the revelation of Jesus Christ” (1 Pet. 1:7). The number of faithful martyrs dying for the sake of Christ has been completed, meeting the conditions of the fifth seal and initiating the sixth, the sign of the Day of the Lord. In the interlude between the sixth and seventh seals we see the multitude “which no one could count” coming out of the great tribulation, as the true church is rescued from the wrath of Satan (Rev. 12:12) and brought into the presence of God, before the wrath of God is poured out on those who remain on earth. The time has come to open the seventh seal which, in turn, will initiate the events of the large scroll, the Day of the Lord, “for the great day of their wrath has come; and who is able to stand?” (Rev. 6:17). What exactly is the Day of the Lord? What will this momentous day be like? Some of the most vivid writing in all of Scripture is used to describe this awesome event. It will be an event like none that has ever happened before, or like any that will ever happen again. The Day of the Lord is described in graphic detail by eight prophets in the Old Testament, mentioned explicitly by three New Testament writers (Luke, Paul, and Peter), and alluded to by all the other New Testament authors. It is therefore essential that we have a thorough understanding of this day of judgment in order to have a clear perspective of the end times. The importance of this day cannot be overstated. * It is the focal point of the end times. In reality, the events associated with the second coming (parousia) of Christ and the Day of the Lord are one and the same. It will begin suddenly and unexpectedly when God intervenes to cut short the great tribulation by Antichrist. The coming of Christ will simultaneously involve the deliverance of the righteous (the Day of Christ) and the beginning of God’s judgment on the wicked (the Day of the Lord), as Christ returns as both Savior and Judge. Though we have already seen that the Day of the Lord will be initiated with the glorious deliverance of the saints, we still need to see clearly what this day will mean for the ungodly who remain on earth after the church is raptured. As seen in Zephaniah, the Day of the Lord will be that climactic event in history when God will pour out His wrath in judgment on the wicked world. When we compare Old Testament passages such as this with the Day of the Lord passages in the New Testament, we find the same graphic description of God’s judgment. Simply stated, the Day of the Lord will be unlike any day that has occurred before in history. Indicating something of the total devastation accompanying the Day of the Lord, Christ gives only two illustrations, both from Old Testament times. The first is the total destruction of the world by the worldwide flood in Noah’s day, and the second is the complete and awesome destruction of Sodom and Gomorrah by fire and brimstone (see Luke 17:26–30). The Flood was a judgment by water, after which God gave the rainbow as a guarantee that He would never again destroy the earth by this means (see Gen. 9:12–15). But God has never promised that He will not destroy the world by fire, and instead predicted unequivocally and unconditionally that “the present heavens and earth by His word are being reserved for fire, kept for the day of judgment and destruction of ungodly men” (2 Pet. 3:7). Thus, as predicted by Peter, the Day of the Lord will clearly be a judgment by fire. Scripture often depicts fire as symbolic of judgment. But as we look more closely at passages associated with the Day of the Lord, we see that the judgment by fire related to this final outpouring of God’s wrath obviously is to be taken literally. The prophets repeatedly identified the Day of the Lord with fire. For example, Isaiah proclaimed: “Behold, the Lord will come in fire and His chariots like the whirlwind, to render His anger with fury, and His rebuke with flames of fire. For the Lord will execute judgment by fire and by His sword on all flesh, and those slain by the Lord will be many” (Isa. 66:15, 16). Joel said of God’s enemies, in “the Day of the Lord [that] is coming…a fire consumes before them, and behind them a flame burns” (Joel 2:1, 3). In his warning to the ungodly in the end times, Zephaniah declared: “ ‘Therefore, wait for Me,’ declares the Lord, ‘for the day when I rise up to the prey. Indeed, My decision is to gather nations, to assemble kingdoms, to pour out on them My indignation, all My burning anger; for all the earth will be devoured by the fire of My zeal’ ” (Zeph. 3:8). In the New Testament, John the Baptist spoke of Jesus burning “up the chaff with unquenchable fire” (Matt. 3:12). Similarly, in His parable of the wheat and tares, Jesus spoke of the angels gathering the tares to be “burned with fire…at the end of the age” (Matt. 13:39, 40), and He spoke of Himself as having “come to cast fire upon the earth” (Luke 12:49). Likewise, Paul declared that in the last days “the Lord Jesus shall be revealed from heaven with His mighty angels in flaming fire” (2 Thess. 1:7). Although God has often used natural disasters and human means as His instruments of judgment—as when he used “Assyria [as] the rod of [His] anger” (Isa. 10:5)—His end-time judgment will be entirely supernatural, administered directly by Himself, through His avenging angels. It will not be executed through any human or natural means, like the events associated with the first three seals of the first half of the seventieth week. The entire world will know that the fiery calamity on earth is the judgment of God, not an offensive strike by a hostile government or an act of nature (Ezek. 38:23; cf. Isa. 2:17; Rev. 6:16, 17). With the breaking of the seventh seal, the large scroll is opened and the Day of the Lord will begin. And as would be expected, the initial verses of Revelation 8 correspond perfectly with what other Scriptures have already told us about this awesome day. Immediately after the solemn period of silence, seven heavenly angels will be given the task of reaping the earth. As John writes, “seven angels who stand before God” will be given the “seven trumpets” of God’s judgment (see Rev. 8:2, 6–13; 9:1–21; 11:15–19). “And another angel came and stood before the altar, holding a golden censer.… And the angel took the censer; and he filled it with the fire of the altar and threw it on the earth; and there followed peals of thunder and sounds and flashes of lightning and an earthquake. And the seven angels who had the seven trumpets prepared themselves to sound them” (Rev. 8:3, 5, 6). As the first six trumpets sound in succession, the great wrath of God will be released in progressively more destructive afflictions on mankind. When the trumpet of the first angel sounded, “there came hail and fire, mixed with blood, and they were thrown to the earth; and a third of the earth wasburnt up, and a third of the trees were burnt up, and all the green grass was burnt up. And the second angel sounded, and something like a great mountain burning with fire was thrown into the sea; and a third of the sea became blood” (vv. 7, 8, emphasis added). Similarly, when “the third angel sounded…a great star fell from heaven,burning like a torch, and it fell on a third of the rivers and on the springs of waters” (v. 10, emphasis added). And when “the sixth angel sounded…this is how I saw in the vision the horses and those who sat on them: the riders had breastplates the color of fire and of hyacinth and of brimstone; and the heads of the horses are like the heads of lions; and out of their mouths proceed fire and smoke and brimstone. A third of mankind was killed by these three plagues, by the fire and the smoke and the brimstone, which proceeded out of their mouths” (9:13, 17, 18, emphasis added). Only the fourth and fifth trumpet judgments will involve no fire. As seen repeatedly in the Old and New Testaments, the Day of the Lord will see the unleashing of God’s wrath on the wicked world, in a final, total, and climactic way. Although this is the unequivocal teaching of Scripture, many today, even in the church, are unwilling to accept the reality of God’s wrath. “God is indeed a God of love,” they will tell you, “that loved us so much that He gave His only Son to suffer and die for our own sins; ‘God is not willing that any should perish, but that all might come to repentance and salvation’ ” (2 Pet. 3:9). Indeed, God is long-suffering and compassionate, as the Scriptures teach repeatedly. But God is equally a God of holiness, righteousness, and judgment; and because of this, He cannot and will not let wickedness, sin, and rebellion of the children of Satan go unpunished. Even the context of the classic argument that God is “not wishing for any to perish,” is given within the larger context of the Day of the Lord, when “the present heavens and earth by His word are being reserved for fire, kept for the day of judgment and destruction of ungodly men” (2 Pet. 3:7). The wrath of God that is to be poured out on the ungodly during the Day of the Lord, therefore, is the righteous consequence of God’s character as a God of love and holiness. Every opportunity will have been given to the ungodly to repent and call upon God for mercy until they choose, instead, to worship the beast or his image. Just as the Scriptures reveal, those who will be killed during this awesome time of God’s wrath “did not repent of the works of their hands, so as not to worship demons, and the idols of gold and of silver and of brass and of stone and of wood…and they did not repent of their murders nor of their sorceries nor of their immorality nor of their thefts” (Rev. 9:20, 21). Thus, the wrath of God in the last days will be the necessary consequence of blatant, unrepentant rebellion against a holy, loving God; and if we ignore or minimize the reality of God’s wrath, we do so to our own eternal peril. Like all others who worship the beast or his image, Jews who do so will escape the great tribulation by Antichrist only to be cast into the wrath of God. Then “they shall fling their silver into the streets, and their gold shall become an abhorrent thing; their silver and their gold shall not be able to deliver them in the day of the wrath of the Lord.… they made the images of their abominations and their detestable things with it; therefore I will make it an abhorrent thing to them” (Ezek. 7:19, 20). For this reason the prophet Amos warned the nation of Israel, “you who [have compromised with Antichrist] are longing for the Day of the Lord, for what purpose will the Day of the Lord be to you? It will be darkness and not light; as when a man flees from a lion [the great tribulation of Antichrist], and a bear meets him [the Day of the Lord], or goes home, leans his hand against the wall, and a snake bites him” (5:18, 19). The prophet Malachi comes right to the point: “But who can endure the day of His coming? And who can stand when He appears? For He is like a refiner’s fire and like fullers’ soap. And He will sit as a smelter and purifier of silver, and He will purify the sons of Levi and refine [the Hebrew word zaqaq, more properly translated purge as in the kjv] them like gold and silver, so that they may present the Lord offerings in righteousness” (Mal. 3:2–3). Likewise, as the prophet Zechariah wrote, “ ‘It will come about in all the land,’ declares the Lord, ‘that two parts in it will be cut off and perish [either during the great tribulation by Antichrist, or the Day of the Lord by God]; but the third will be left in it. And I will bring the third part [of Israel] through the fire, refine [Hebrew word tsaraph, which can also mean “to purge away”] them as silver is refined, and test them as gold is tested [during the Day of the Lord]. They will call on My name, and I will answer them; I will say, “They are My people,” and they will say, “The Lord is my God” (Zech. 13:8, 9; cf. Mal. 3:1–3). Thus, as the prophets so clearly warned the natural line of Abraham, God will use His wrath to purge, purify, and cleanse the nation Israel, as He did the 144,000 in the Edomite wilderness (see Ezek. 20:33–38). When all is said and done, between the wrath of Satan and the wrath of God, only a third of unbelieving Israel will survive the seventieth week of Daniel (Dan. 9:24), when “the fulness of the Gentiles has come in” (Rom. 11:25). Only then “all Israel will be saved” (Rom. 11:26 cf. Dan. 9:24), for only then will they acknowledge, “The Lord is my God” (Zech. 13:9), thereby completing the spiritual Kingdom of God and bringing an end to the rule and kingdom of Satan. When the Day of the Lord begins, Christ brings about a very significant change in the amount of “freedom” that Antichrist has exercised since Michael, the restrainer, has been removed. At the appearance of Christ’s coming (parousia) (2 Thess. 2:8), Antichrist will again feel the effects of restraint, but this time the one who restrains will be Christ, not Michael. And with this restraint, those of the nation of Israel who have refused to give their allegiance to Antichrist will begin to fight back, not unlike the Jews who fought back in the Maccabean revolt in the days of Antiochus Epiphanes, the foreshadower of Antichrist. The Scriptures reveal that Satan will be cast down from heaven at the midpoint of the seventieth week, and that he will exercise “great wrath, knowing that he has only a short time” (Rev. 12:12). Satan’s divinely permitted but restricted presence and power on earth will continue throughout his allotted forty-two months, after which, thirty days later, Antichrist and his armies will be defeated by Christ at the Battle of Armageddon. “lawless one [Antichrist] will be revealed whom the Lord will slay with the breath of His mouth and bring to an end by the appearance of His coming; that is, the one whose coming is in accord with the activity of Satan, with all power and signs and false wonders” (2 Thess. 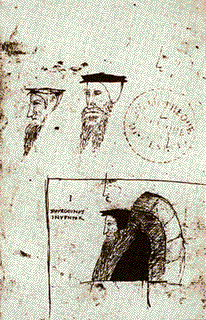 2:8, 9). This interpretation gives greater meaning to Jesus’ statement that “unless those days had been cut short, no life would have been saved; but for the sake of the elect those days shall be cut short” (Matt. 24:22). “Those days” is frequently taken to refer to the second half—the last three and a half years—of the seventieth week. But the context makes clear that Jesus was talking specifically about “cutting short” the persecution of Antichrist, not about “cutting short” the time allotted to his authority to rule on earth (Rev. 13:5). If God were to cut short the three and a half years, the seventieth week would no longer be a “week,” since, by definition, the last half would then be less than three and a half years making Daniel’s prophesy in chapter 9 wrong. Scripture emphatically teaches that this is not the case! The persecution of Antichrist will be ended when the object of his persecution is taken away (at the Rapture) and Christ renders Antichrist helpless, idle, or paralyzed from the time of Christ’s coming until his time on earth is ended. This interpretation also fits well Isaiah’s classic Day-of-the-Lord prophecy: “For the Lord of hosts will have a day of reckoning.… And the pride of man will be humbled, and the loftiness of men will be abased, and the Lord alone will be exalted in that day” (Isa. 2:12, 17). During this period of the Lord’s “day of reckoning” (the Day of the Lord), the ungodly will “be abased,” their leader and lord “rendered useless” before they are judged and destroyed. With Antichrist greatly restricted, persecuted Jews, for the first time since Antichrist took control of Jerusalem and the world, will have some opportunity to carry out a resistance movement against Antichrist. Thus those Jews who have somehow escaped his persecution (other than the 144,000 firstfruits of Israel—who will be under God’s protection in the wilderness), will venture out to launch guerrilla attacks against the surrounding nations that will have gathered in the valley of Jehoshaphat just before the Day of the Lord will begin (Joel 3:11–16). “In that day [the Day of the Lord] I will make the clans of Judah like a firepot among pieces of wood and a flaming torch among sheaves, so they will consume on the right hand and on the left all the surrounding peoples, while the inhabitants of Jerusalem again dwell on their own sites in Jerusalem” (Zech. 12:6, emphasis added). In this passage, of course, “that day” refers to the Day of the Lord, when Antichrist will be “rendered useless” or “paralyzed” “by the appearance of His coming” (2 Thess. 2:8). As a result some Jews who have been so fiercely persecuted will “again dwell on their sites in Jerusalem,” while others (the clans of Judah) will turn against the restricted forces of Antichrist and return havoc for havoc. In chapter 5 of this book, a prophetic passage (Dan. 9:24–27) was introduced as one of the most critical passages of all prophetic Scripture. Because of the nation’s continued disobedience to God, the nation of Israel had been subjugated to Babylon in 586 b.c., the temple of Solomon had been destroyed, and their great Defender was withdrawing the protection He had so often provided in the past. Seeing the tragic condition of Israel, Daniel poured out his heart in prayer, pleading with God Almighty to forgive and act on behalf of His chosen nation. In response, God sent His angel Gabriel to Daniel with this message, in part, outlining six things God would do and when He would do them, for the natural, obedient line of Abraham! I say then, they [the natural line of Abraham] did not stumble so as to fall, did they? May it never be! But by their transgression [completed at the end of the seventieth week] salvation has come to the Gentiles, to make them jealous. Now if their [Israel’s] transgression be riches for the world and their failure be riches for the Gentiles, how much more will their [Israel’s] fulfillment be! …For I do not want you, brethren, to be uninformed of this mystery, lest you be wise in your own estimation, that a partial hardening has happened to Israel [because of her trans- gression, her sin, her iniquity] until the fulness of the Gentiles has come in [the end of the seventieth week]; and thus all Israel [that survives the wrath of Satan and the wrath of God] will be saved… (Rom. 11:11, 12, 25, 26a). The fullness of the Gentiles will have come in. The sequence of events that transpire during the seventieth week of Daniel are recorded in chronological order in Revelation 5:1–9:21. 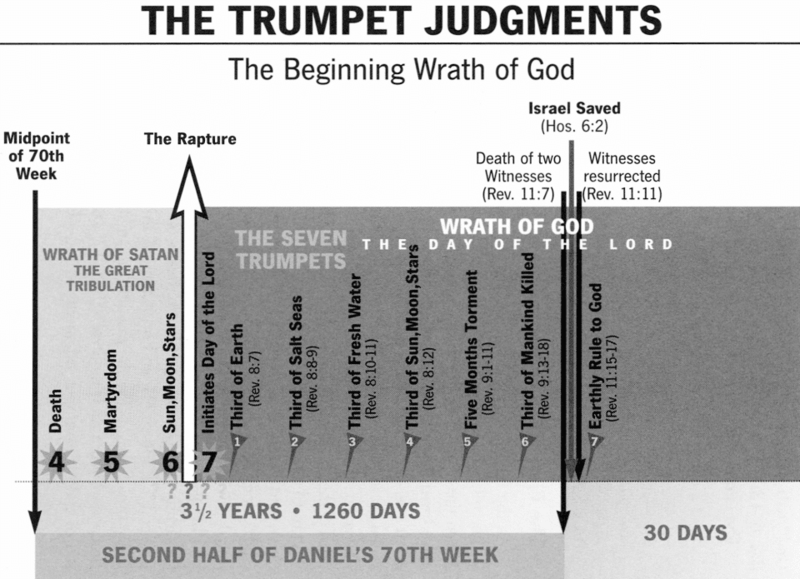 The seventieth week ends after the sixth trumpet judgment kills a third of mankind, following the first woe associated with the fifth trumpet butbefore the second woe that occurs just prior to the blowing of the seventh trumpet, after the resurrection of the two witnesses (see three woes chart on the following page for a visual confirmation of this very important timing sequence). When the seals, trumpets, and bowls are taken in sequence, it can be quickly seen that the seventh seal, the Day of the Lord, follows the sixth seal, the sign of the Day of the Lord, which follows the fourth seal, the great tribulation of Antichrist, an event that begins at the midpoint of the seventieth week. Having been “[trod] under foot…for forty-two months” (Rev. 11:2), “until the times of the Gentiles be fulfilled” (Luke 21:24), Israel’s purging and purifying will now be complete. Now that the “fulness of the Gentiles has come in…all Israel will be saved” (Rom. 11:25, 26). The time of her full redemption, “to bring in everlasting righteousness” (Dan. 9:24), will begin with the opening of the “small scroll” or “little book” as recorded in Revelation 10:2. The contents of the little book reveal bittersweet truths. John reports, “I took the little book out of the angel’s hand and ate it, and it was in my mouth sweet as honey; and when I had eaten it, my stomach was made bitter. And they said to me, ‘You must prophesy again concerning many peoples and nations and tongues and kings’ ” (vv. 10, 11). As we will see in the next chapter, the sweetness represents God’s gracious redemption of Israel, which will complete the spiritual Kingdom of God, thus bringing in the physical Kingdom of God over which Christ will rule. The bitterness represents the final wrath of God, the worst ever to be poured out on mankind which will be as swift as it is devastating upon the kingdom of darkness. But first we must understand a very simple, yet incredibly significant prophetic truth—the piece of the puzzle that makes all the rest fit together perfectly! The death of the two witnesses, the seventh trumpet judgment, the seven bowl judgments that follow, and the climactic Battle of Armageddon all occur after the seventieth week is complete, in the following thirty days. 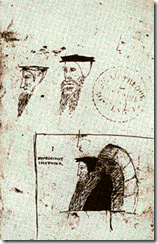 Whereas the large scroll represented the events of the seventieth week, the little scroll—with its bittersweet contents—is a record of the events that occur after the seventieth week is complete. Almighty God begins His reign over earth. This thirty-day period will be the time when Christ reclaims the nation of Israel that survives the seventieth week, when God Almighty reclaims the rule over earth from Satan, and when Christ reclaims physical possession of earth at the Battle of Armageddon. 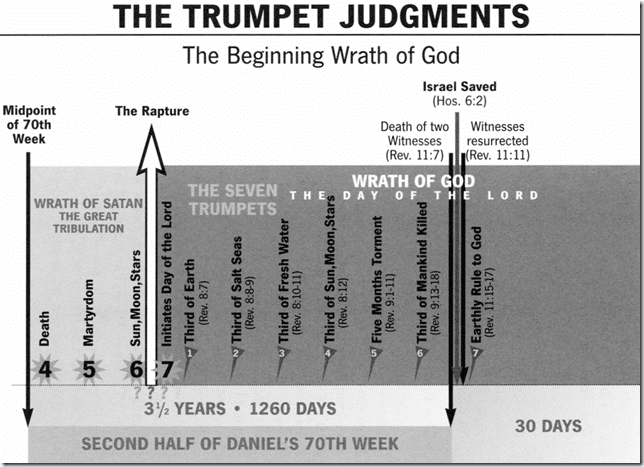 To understand this all-important truth, it is necessary to look carefully at Daniel 12:11: “And from the time that the regular sacrifice is abolished, and the abomination of desolation is set up, there will be 1290 days [three and a half years plus thirty days].” Christ speaks of the “ABOMINATION OF DESOLATION which was spoken of through Daniel the prophet” as “standing in the holy place” (Matt. 24:15) when the great tribulation by Antichrist begins at the midpoint of the seventieth week. Therefore, it is apparent that the “abomination of desolation” referred to by Daniel is, in fact, Antichrist when he “opposes and exalts himself above every so-called god or object of worship, so that he takes his seat in the temple, displaying himself as being god” at the midpoint of the seventieth week (2 Thess. 2:4). “will make a firm covenant with the many for one week [i.e., seven years], but in the middle of the week he will put a stop to sacrifice and grain offering; and on the wing of abominations will come one who makes desolate, even until a complete destruction, one that is decreed, is poured out on the one who makes desolate” (9:27, emphasis added; cf. Matt. 24:15; 2 Thess. 2:4). In other words, Daniel 9:27, as well as the other passages to which we have referred, clearly indicate that the abolition of the regular sacrifices and the setting up of the abomination of desolation will be initiated at the same time, at the midpoint of the seventieth week. How can we reconcile these passages that seem contradictory—several of which clearly teach that these two events will occur at the same time—and the critical text, Daniel 12:11, which would seem to indicate a 1,290-day interval between these two events? The solution lies in the simple fact that Daniel was referring to the “duration” of the abomination, not to the “interval” between the abolishing of the regular sacrifice and the setting up of the abomination. In other words, Antichrist’s desecration of the temple (stopping the sacrifice and demanding the world’s worship from “the holy place”) will continue from the middle of the week—that is, from the point when Antichrist “puts a stop to sacrifice and grain offering”—for 1,290 days “until a complete destruction, one that is decreed, is poured out on the one who makes desolate” (Dan. 9:27). This, of course, corresponds to three and a half prophetic years of 360 days each (3.5 x 360 = 1,260 days) plus a thirty-day period immediately following the last half of the seventieth week. The angel gives to the prophet yet one revelation more regarding the duration of the time of tribulation and its end.… All interpreters therefore have found in these two verses statements regarding the duration of the persecutions.… Since all interpreters rightly understand that the 1,290 and the 1,335 days have the same “terminus a quo,” and thus that the 1,290 days are comprehended in the 1,335, the latter period extending beyond the former by only forty-five days; then the oppression cannot properly last longer than 1,290 days, if he who reaches to the 1,335 days is to be regarded as blessed. We therefore know with certainty that Antichrist will be destroyed on the last day of the thirty-day period—exactly 1,290 days (three and a half years plus thirty days) after he desecrates the temple by abolishing the sacrifice and demanding the world’s worship at the midpoint of the seventieth week. As we shall see, this is in perfect keeping with a literal sequential view of the Book of Revelation. A literal hermeneutic of Revelation demands that the Day of the Lord will continue after the seventieth week is complete, culminating later in the great Battle of Armageddon as argued earlier in this chapter. The key, then, to making the obvious sequence of the Book of Revelation fit Daniel’s seventieth week is to understand one simple fact—that Antichrist, although given authority for forty-two months, will not be defeated and evicted from earth’s premises until the end of the thirty days that follow the close of the seventieth week. Then the sequence of the seals, the trumpets, the bowls, and Armageddon moves smoothly, one event after the other, perfectly harmonizing the prophecies of Daniel given over six hundred years earlier. During this brief thirty-day period, Christ will accomplish much, as we shall see in the next chapter, with every day building up steadily to the climactic ending at the Battle of Armageddon, when the abominator of God’s “holy place” is destroyed and the earth is reclaimed by Christ for eternity. And so, until the close of the seventieth week of Daniel, battles will be fought on different fronts, the wrath of God bringing judgment to the world in general, the clans of Judah now having the upper hand as they counter attack against the forces of Antichrist. Instead of Antichrist being the pursurer, after the coming of Christ he becomes the pursued. Thus, the seventieth week will end the day before the death of the two witnesses. Still to follow is the all-important seventh trumpet judgment, including the seven bowl judgments (the final wrath of God), and finally, the Battle of Armageddon. 1. “Whom the Lord will slay.” The nasb uses the Greek wordanelei, from anaireo (Strong’s, #337), which means “to put to death, kill, slay, take away or take up.” On the other hand, the kjv uses the Greek word analosei, from analisko (#355) which means “to consume, to use up or spend up.” This verse is in reference to Isa. 11:4 in the context of the Day of the Lord (v. 11), where the prophet states that “with the breath of His [the Lord’s] lips He will slay the wicked [singular].” Therefore this writer prefers the nasb manuscripts that render Christ “slaying” Antichrist, not “consuming” him. 2. “Whom the Lord will bring to an end.” The Greek wordkatargeo (“bring to an end”) is a compound of two other Greek words, kata (down) and argeo (to be idle, to reduce in activity, to abolish), and can therefore legitimately be translated as “rendered useless.” See Strong’s, #2673, 691; W. E. Vine, An Expository Dictionary of New Testament Words (Westwood, N.J.: Revell, 1940), 1:13. 3. In their multivolume commentary on the Old Testament, C. F. Keil and Franz Delitzsch observe that “there is no good ground for referring this expression [“the most holy”] to the consecration of the altar of burnt-offering. Such a reference is wholly excluded by the fact that consecration of Zerubabbel’s temple and altar, as well as of that which was desecrated by Antiochus, was a work of man, while the anointing of a ‘most holy’ in the verse before us must be regarded as a divine act, because the three preceding expressions beyond controversy announce divine actions. Every anointing, indeed, of persons or of things was performed by men, but it becomes a work of God when it is performed with the divinely ordained holy oil by priests or prophets according to God’s command, and then it is the means and the symbol of the endowment or equipment with the Spirit of God.… Therefore, these consecrations cannot be designated as anointings and as the works of God, and the angel [Gabriel, v. 21] cannot mean these works of men by the ‘anointing of a most holy.’.… Much older, more general, and also nearer the truth, is the explanation which refers these words to the anointing of the Messiah, an explanation which is established by various arguments” (Commentary on the Old Testament in Ten Volumes, vol. 9 [Grand Rapids: Eerdmans, repr. 1980], pp. 346, 347, emphasis added). The author believes that all passages dealing with the Day of the Lord focus on two separate parts of this great event—first, as has been demonstrated many times already in this book, it will be initiated by the rapture of God’s elect, cutting short their terrible persecution at the hands of Antichrist. On the same day, then, God will unleash His wrath against the wicked who remain, and against Antichrist and his beast empire nations in particular. This is the very heart of the Day of the Lord. It will be a fiery judgment upon the entire world that remains after the Rapture of the church, one that can only be compared to the first judgment of the world, the great Flood in the days of Noah, or on a more limited basis, to God’s complete and devastating destruction of Sodom and Gomorrah. The Old Testament prophets use the specific term “Day of the Lord” a total of nineteen times. The New Testament writers (Luke, Paul, and Peter) use the term in four passages, all of which deal incontestably with the end times, all of which refer to the time of God’s wrath upon the wicked. On the other hand, there are seven additional passages—primarily in Philippians—using the phrase “day of Christ” or “day of Jesus Christ.” This term is generally understood as the event that initiates the Day of the Lord, but instead of having the Day of the Lord’s negative connotation for the world, the “Day of Christ” has a positive connotation for the church, referring to the Rapture of the church, that great hope of every believer that initiates the Day of the Lord. It is my opinion, and it is a basic assumption of this book, that every reference to the Day of the Lord is primarily a reference to this single, end-time event, initiated by the Rapture, followed by God’s wrath on those who remain. In almost every instance, the language of the text itself indicates that the context is worldwide and futuristic. In the few cases in which the phrase “Day of the Lord” (or the equivalent) is not used explicitly of the end times, a near/far application of these texts and their contexts do not exclude association with the end times, as these nonspecific references to the Day of the Lord contribute directly or indirectly to a better understanding of God’s revelation regarding the last days. For a number of logical reasons, the context of 2 Peter 3 demands that the Day of the Lord being described in this passage, must precede the Millennium, rather than occur at the end of it, as some prophetic scholars would have us believe, especially those holding to a pretribulational Rapture view. First, the phrase “the last days” (v. 3) is nowhere else used in Scripture as a reference to the end of the Millennium, but is frequently used in relation to the Rapture (see, e.g., John 6:39, 40, 54), to the resurrection of the dead (John 11:24), and to the end of this present church age (Acts 2:17; 2 Tim. 3:1). Second, if Peter were speaking of a Day of the Lord at the end of the Millennium, no one would be asking questions about Christ’s coming (v. 4), because He would currently be ruling over the earth, just as He had been for the previous thousand years. Third, if the “dual” Day of the Lord position were correct, the Day of the Lord at the second coming of Christ—the most traumatic event in history—would already have occurred only a thousand years earlier. No one during the Millennium (most of which will live long years—Isa. 65:20) would make the absurd comment that “all continues just as it was from the beginning of creation” (v. 4). Fourth, Peter’s reference to the Day of the Lord coming like a thief (v. 10) parallels Paul’s Day-of-the-Lord passage in 1 Thessalonians 5:2–4, where he explains that “the times and the epochs” of the coming of Christ to rapture the church, will come like a thief in the night. Fifth, Peter’s illustrations about the Flood and the destruction of Sodom and Gomorrah (2:4–9; 3:6) are abbreviated versions of identical illustrations given by Christ in the Olivet Discourse, both of which deal directly with the wrath of God that will be poured out upon mankind at Christ’s second coming. Finally, Peter concludes the third chapter by saying, “just as also our beloved brother Paul, according to the wisdom given him, wrote to you, as also in all his letters, speaking in them of these things” (2 Pet. 3:15, 16). Obviously the Day of the Lord is the “these things” of 2 Peter 3. Because Paul teaches more about the Day of the Lord that occurs before the Millennium—one that is initiated by the return of Christ—than any other New Testament writer (with the exception of the Book of Revelation), particularly in his two letters to the church in Thessalonica, Peter’s comments here carry special meaning. Thus, Peter makes it clear that he and Paul are teaching the same truths about the same Day of the Lord. As an aside, it is interesting to note that the Day of the Lord is never spoken of in the plural in the New Testament. 1 “Whom the Lord will slay.” The nasb uses the Greek word anelei, from anaireo (Strong’s, #337), which means “to put to death, kill, slay, take away or take up.” On the other hand, the kjv uses the Greek word analosei, from analisko (#355) which means “to consume, to use up or spend up.” This verse is in reference to Isa. 11:4 in the context of the Day of the Lord (v. 11), where the prophet states that “with the breath of His [the Lord’s] lips He will slay the wicked [singular].” Therefore this writer prefers the nasb manuscripts that render Christ “slaying” Antichrist, not “consuming” him. 2 “Whom the Lord will bring to an end.” The Greek word katargeo (“bring to an end”) is a compound of two other Greek words, kata (down) and argeo (to be idle, to reduce in activity, to abolish), and can therefore legitimately be translated as “rendered useless.” See Strong’s, #2673, 691; W. E. Vine, An Expository Dictionary of New Testament Words (Westwood, N.J.: Revell, 1940), 1:13. This period of time includes the last three and a half years of the seventieth week (forty-two, thirty-day prophetic months) when he will still have authority to rule, as well as an additional thirty-day period (Dan. 12:11), at the end of which God will destroy Antichrist and his armies, then cast him and the second beast into the lake of fire. Nevertheless, until that time comes Antichrist will continue his reign until his allotted time to rule is over, yet he can do very little damage, handcuffed or paralyzed as it were, by the Day of the Lord’s judgmental wrath. It will be during this time—when Antichrist is severely handicapped—that unbelieving Jews who have refused to worship him, other than the 144,000 protected in Edom, will retaliate, taking this opportunity for revenge against the man they so hate. * This truth alone should put to rest the idea that the cruel and ungodly persecutions of the elect of God at the hands of Antichrist could ever be considered a part of God’s wrath. It is even more inconceivable that Antichrist could desecrate the temple, declare himself to be God, demand the world’s worship, and persecute God’s elect during a time when only the Lord will be exalted! (Isa. 2:17). 3 In their multivolume commentary on the Old Testament, C. F. Keil and Franz Delitzsch observe that “there is no good ground for referring this expression [“the most holy”] to the consecration of the altar of burnt-offering. Such a reference is wholly excluded by the fact that consecration of Zerubabbel’s temple and altar, as well as of that which was desecrated by Antiochus, was a work of man, while the anointing of a ‘most holy’ in the verse before us must be regarded as a divine act, because the three preceding expressions beyond controversy announce divine actions. Every anointing, indeed, of persons or of things was performed by men, but it becomes a work of God when it is performed with the divinely ordained holy oil by priests or prophets according to God’s command, and then it is the means and the symbol of the endowment or equipment with the Spirit of God.… Therefore, these consecrations cannot be designated as anointings and as the works of God, and the angel [Gabriel, v. 21] cannot mean these works of men by the ‘anointing of a most holy.’.… Much older, more general, and also nearer the truth, is the explanation which refers these words to the anointing of the Messiah, an explanation which is established by various arguments” (Commentary on the Old Testament in Ten Volumes, vol. 9 [Grand Rapids: Eerdmans, repr. 1980], pp. 346, 347, emphasis added). * See informational note in chapter 12, The Two Witnesses section. Article by: Robert Van Kampen, The Sign, "Updated Edition"–Cover. ; Includes a Detachable, Color Foldout in Back of Book., 3rd rev. ed. (Wheaton, Ill.: Crossway Books, 2000), 347.